Saint Tropez is renowned the world over for its beautiful beaches, crystal blue sea and cool vibe. The scenic town in the South of France has also got itself a name for something else not quite so picturesque: traffic. 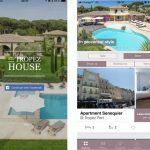 Anyone who has stayed in one of our villas in Saint Tropez before will know that getting in and out of the town in the summer months can be enough to get you reaching for the rosé wine as soon as you finally arrive at your destination. 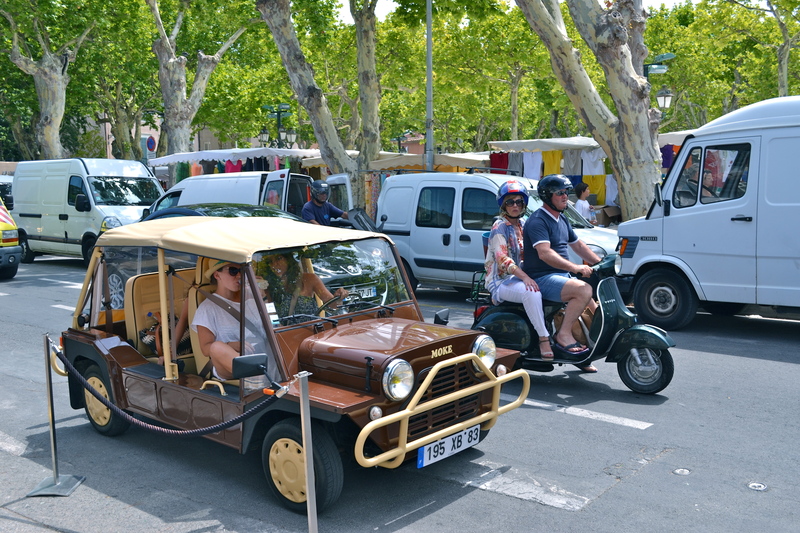 Long lines of traffic building up on the single track road from Sainte Maxime to Saint Tropez in the searing heat can dampen the holiday mood of any sane motorist, as they battle their way to the idyll of their holiday rental. The reason for the jams is the sheer volume of traffic on essentially a tiny, unsophisticated road network, which at any other time of the year adds to the charm of this one in a million holiday spot. No efforts have been made to carve up the stunning countryside to cater for the extra car loads; a factor which must be remembered and applauded. But it can make for frustrating driving nonetheless. Once you have left the motorway there is little chance to overtake on the wiggly road which traverses huge swathes of stunning forests. And when you finally reach the coast, the single track clings to the water’s edge making the journey a remarkably pretty one, if incredibly slow! 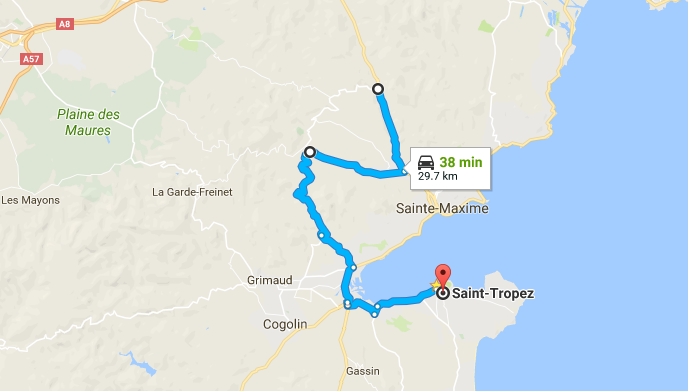 Repeat visitors to Saint Tropez will also know that there is little reprieve from the traffic which strikes at almost all times of the day, from 10am to 7pm on weekends with a slight let up over lunch during the week. If a helicopter transfer in and out of Saint Tropez is not an option, our team of local experts at St Tropez House have come up with these sneaky short cuts to help you drive to and from your St Tropez villa in style. To avoid getting stuck in long lines of traffic once you have left the A8 on the Le Muy turn-off (D25) at Exit 36, which eventually leads you to the congested D559 between Sainte Maxime and Saint Tropez, take Exit 35 at Le Luc (D558), which will bring you through the Garde Freinet, Grimaud and Cogolin and straight into La Foux roundabout at Gassin. 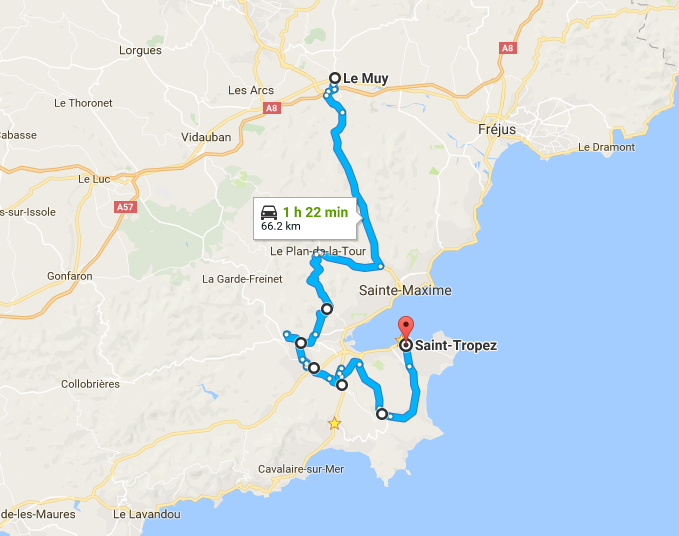 This sneaky short cut is especially useful for motorists coming from Aix-en-Provence, and is worth considering if you are travelling to St Tropez from Nice at peak times. 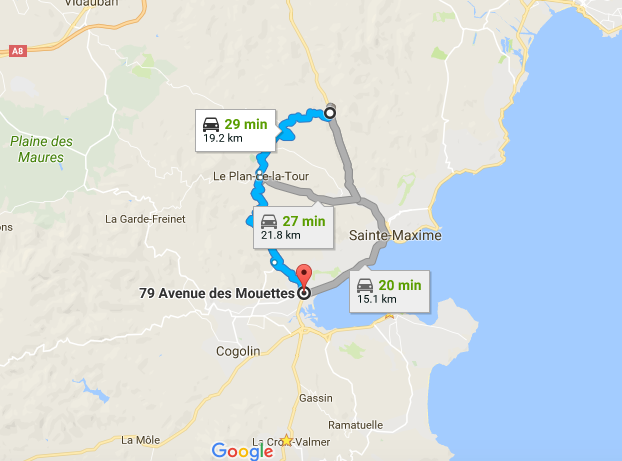 If you find yourself stuck in traffic on the D25 from Le Muy to Sainte Maxime, one possibility to avoid the queues is to head onto the D44 to Plan de la Tour. 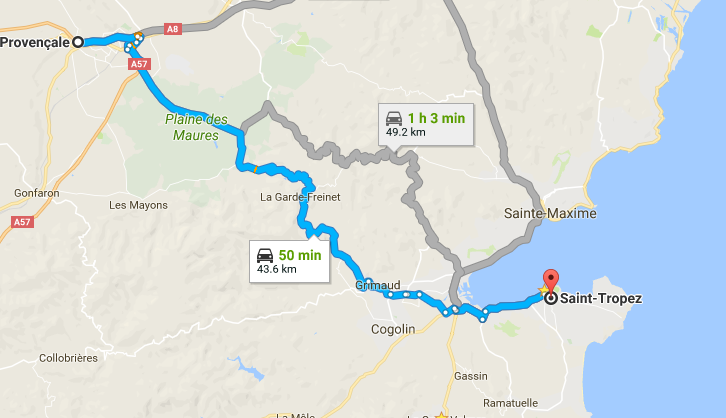 From here you can go all the way to La Foux roundabout at Gassin over the Marres hills which is a stunning way to drop down onto the coast. 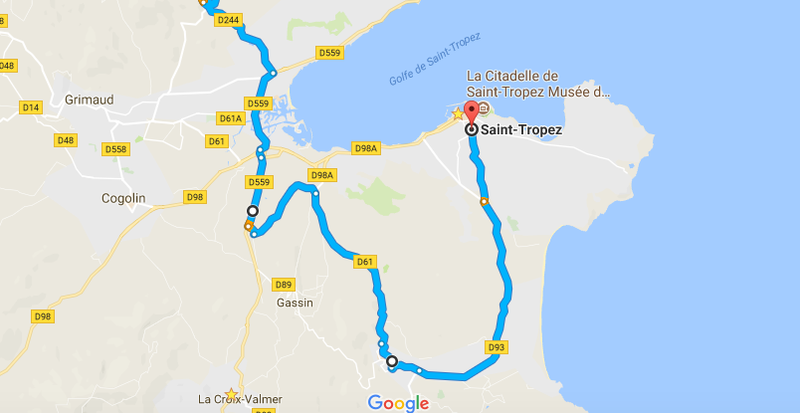 Alternatively, you can cut back onto the main road on the D244 and follow directions to Saint Tropez. If you are in a hurry to catch your plane at Nice Airport or have a meeting in Monaco, a consideration is to take the D44 from Grimaud all the way to the A8 via Plan de La Tour on the D25. This backroad is a real find when the more commonly known exit through Sainte Maxime is congested. 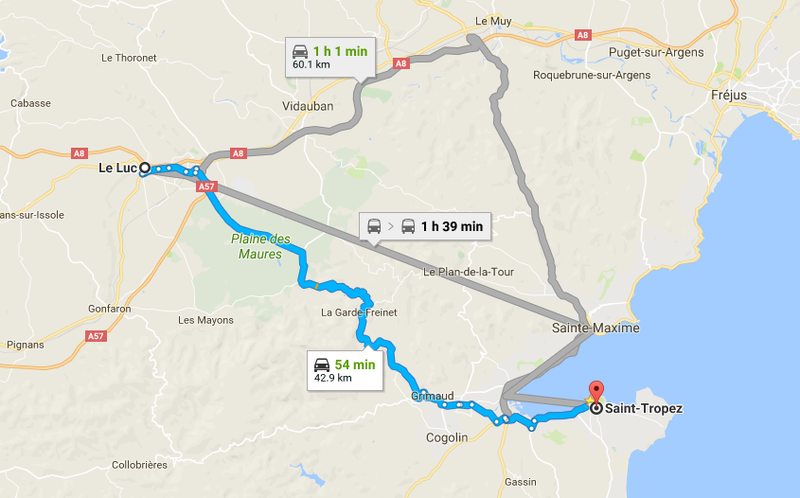 Likewise, if you are leaving your St Tropez rental villa and heading home to the Uk via Aix-en-Provence, follow signs to Grimaud, and La Garde Freinet on the D588 straight out of Saint Tropez towards the A8. The La Foux roundabout is a notorious traffic blackspot which can be hugely frustrating for holidaymakers. However, it can be avoided. Savvy drivers should leave the roundabout on the D559 direction La Croix Valmer and then take the first left after a school before turning left again past the Polo Club de St Tropez on Route de Bourrian. The St Tropez House alternative GPS then recommends you take the first right at the roundabout towards Ramatuelle on the picturesque D61, which will take you past the Minuty & La Roulliere vineyards, before turning left onto the D93 Route Des Plages if you are heading to the beach clubs on Pampelonne. Alternatively, if you are heading to Place des Lices in Saint Tropez village, take Chemin de Sainte Anne. There is little worse than getting stuck in a hot car after a relaxing day on the beach. To avoid this nightmare, we recommend you head left out of Patch, Epi, Tamaris, or other beach club roads onto the Route des Plages D93. Continue on this road towards Ramatuelle village, before turning right onto the D61 past the Minuty & La Roulliere vineyards and onto the main D98A past the La Foux roundabout. If you don’t mind winding mountain roads and fancy getting away from the crowds, there are a couple of sneaky routes that we recommend in the hills above Saint Tropez. For example, take the D559, a mountain road between La Croix Valmer and Ramatuelle and the D98 to Toulon, La Mole, or Cogolin for a beautiful shortcut. 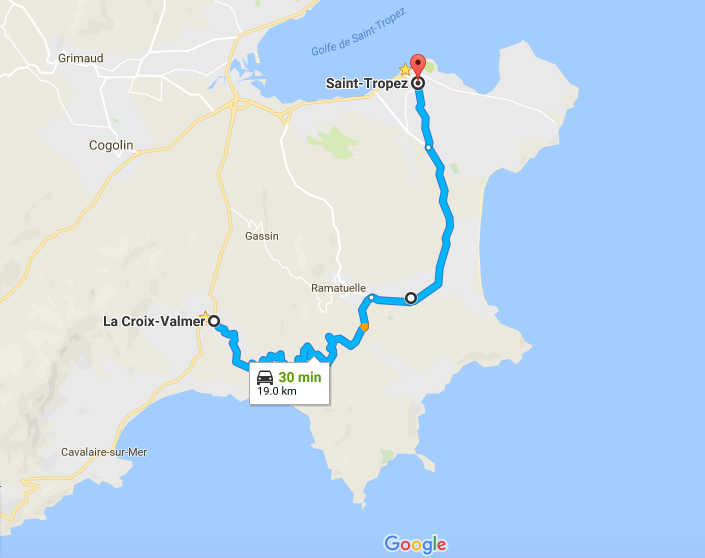 To get to the beach clubs on Pampelonne in a calm and collected fashion, use the Chemin de Sainte Anne, there and back. We sincerely hope that these shortcuts make your holiday in Saint Tropez as problem-free as possible. If you discover any other sneaky diversions to help others avoid traffic, please let us know.